As all you fans of horribly infectious pathogens already know, Ebola Reston, the disease so nice they named it after an earth-toned planned real estate development, jumped from pigs in the Philippines to several farm workers, so the Philippine government had an emergency meeting in a secret undisclosed location (the warehouse where Imelda Marcos used to store her shoes) and decided to cull 6,000 pigs to keep the disease from spreading. Only thing was, they only had one stun gun to do the dirty work, and it kinda broke. 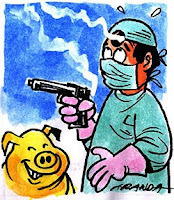 PANDI, Bulacan , Philippines – A faulty stun gun has stalled the mass slaughter here of pigs exposed to the Ebola-Reston virus. Dr. Davinio Catbagan of the Bureau of Animal Industry said they were able to destroy 442 pigs on Sunday but a defective stun gun forced them to stop the procedure yesterday. Officials said they expect to complete the slaughter, burning and burial of 6,000 pigs exposed to the Ebola-Reston virus tomorrow night. “Our stun gun jammed, thus slowing the procedure,” an official who declined to be named said. The official said they even had to use a .22 caliber gun to keep the procedure going. “They are making adjustments,” she told reporters. And lest anyone thing we're being insensitive to the plight of the soon-to-be-bacon, we'd like to point out the above illustration actually came from a newspaper article describing the hog slaughter. Stay classy!